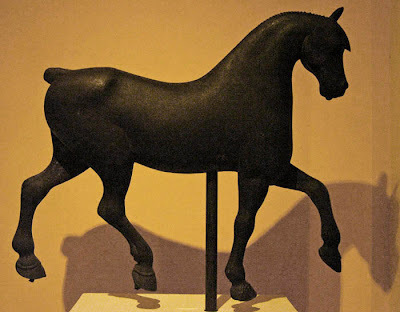 Imagine this "Formal Horse" atop your barn, trotting boldly into the wind. This 19th century weathervane is part of the large collection of folk sculpture at the Shelburne Museum which consists of shop signs and whirlagigs, weathervanes and decoys, and miniature circus and circus parade, in style from refined to bold. The lines of this horse are so sensitive, so expressive of the floating power of this beautiful animal. It has as much life in its form as the more realistic horses on the Parthenon friezes. 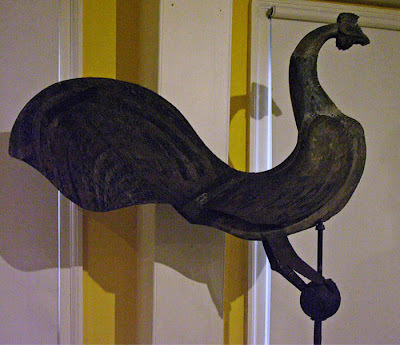 The maker of this early 19th century weathervane took more liberties with its design, making the rooster from a large, sweeping S curve. The way the thin head and neck swoop into the body and back up into the large tail is almost musical in its composition. This rooster once adorned the barn of the Old Fitch Tavern in Bedford, MA. This fiercely comic – look at those teeth! 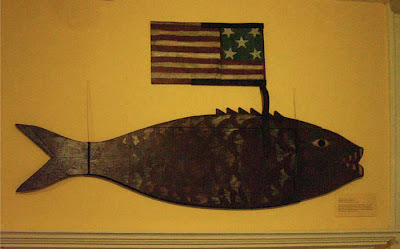 – fish was probably a trade sign and is from mid-19th century New York. It is also a proudly patriotic fish. Repeated overlapping curved lines simply represent its scales, light moons bounded by hills. Here is another fish sculpture, much smaller and for a different use. 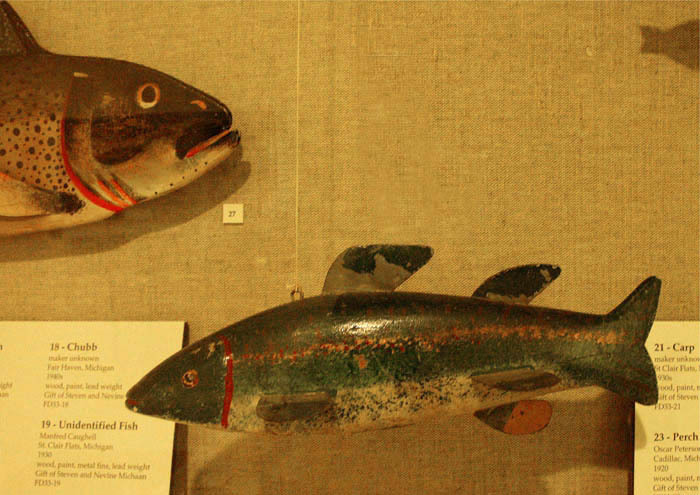 I remember that during my first visit to the museum years ago I fell most in love with the bird and fish decoys because they were so new to me. I had never seen decoys before, and this collection opened up a whole new world to me. 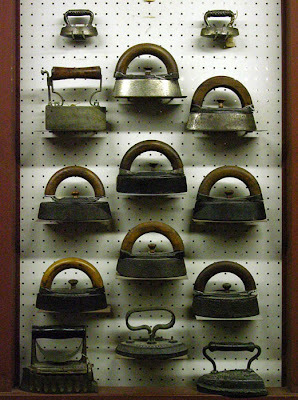 I admired the shapes, the colors, the crafting of these objects. 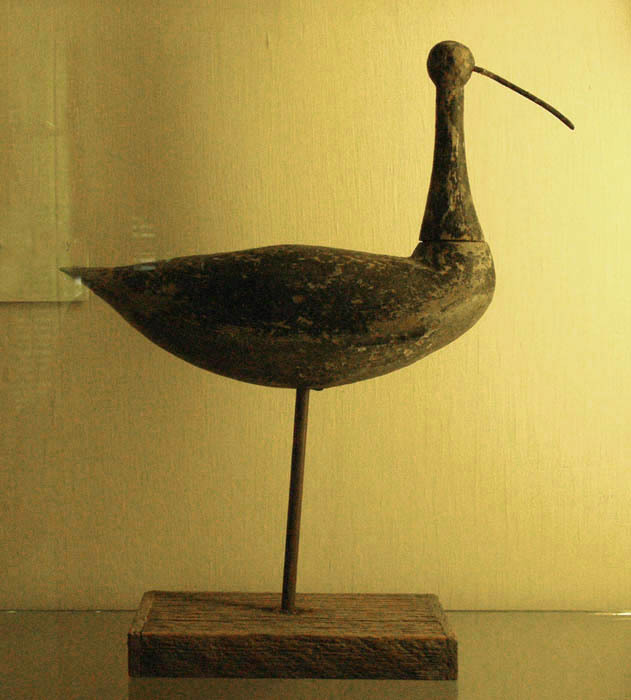 Shore birds, generally shown standing high on a post, are my favorites of the bird decoys with their very simple shapes. This 19th century bird from New Jersey is crudely carved, but at the same time its curves are perfect, from the swelling belly to the pointed tail, and the neck narrowing to the spherical head adds a touch of geometry and of humor, extending into the line of the beak. 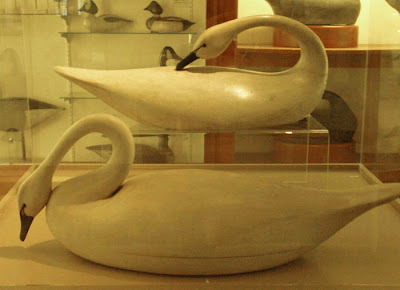 These are contemporary carvings, so lovely in their graceful lines. 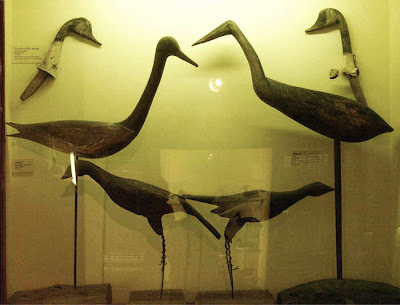 The makers of these decoys are so clearly enamored of their subjects, and so knowledgeable. The hand shaped a small life, with simplicity and grandeur. 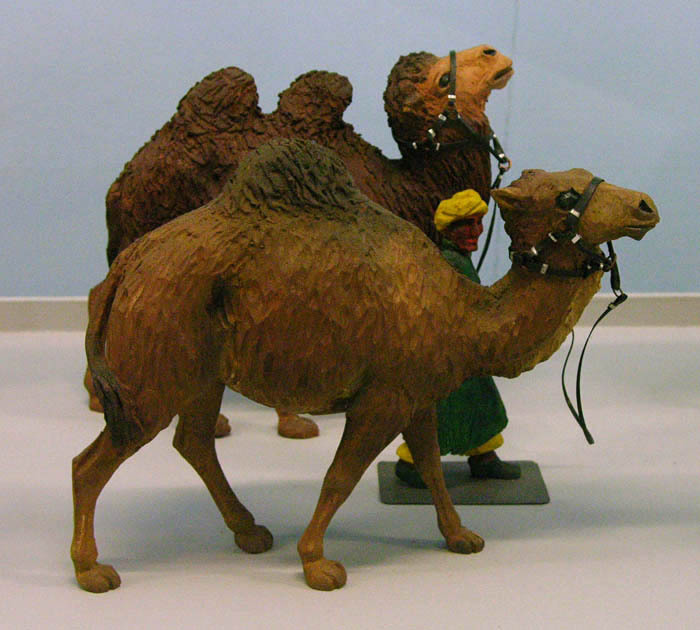 The final two pairs of animals come from a miniature circus parade made by Roy Arnold 1925-1955, with the help of some assistants. The entire extravagant parade, with animals and performers, cowboys and clowns, tableaus and wild animals, stretches over 500 feet at a scale of 1 inch to 1 foot. 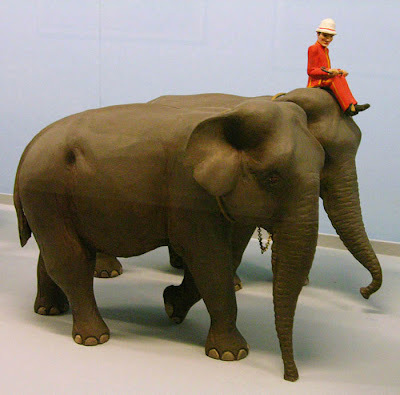 It is a marvel and a delight, and calls up memories of circuses from childhood, when the world was mysterious and magical. Tropical storm Irene arrived in Vermont yesterday with heavy rain and high, but not extraordinary, winds. I spent the day in the kitchen of my high and mostly dry house for comfort, making jam and zucchini bread and other goodies, while worrying about my family on the Jersey shore and my friends and family in NYC. Thank goodness the storm wasn't as terrible as feared. After thinking I'd dodged a bullet, my power went out at 5 PM and returned this morning at 10 AM, in time to save the summer produce packed into the freezer. 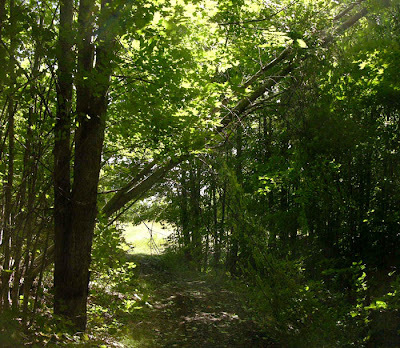 The day was bright and breezy, so I put on my sneakers and went for a walk in the woods, thinking I might find damage there. All I found was this one young tree, its roots dislodged, leaning over the path. The small stream running through the woods that had been dry for weeks is now singing as it runs over rocks and pebbles and the roots of trees. Of course the mushrooms are happy with the additional water: almost 7 inches in my rain gauge. This gorgeous coral mushroom, about 3 inches high, has sprung from a fallen log. 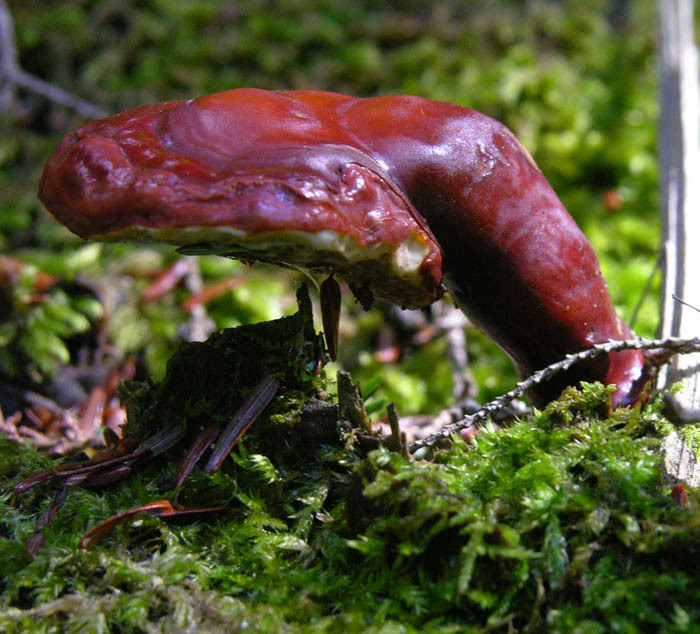 The hard shiny red of a varnished mushroom glows like a piece of stained glass. 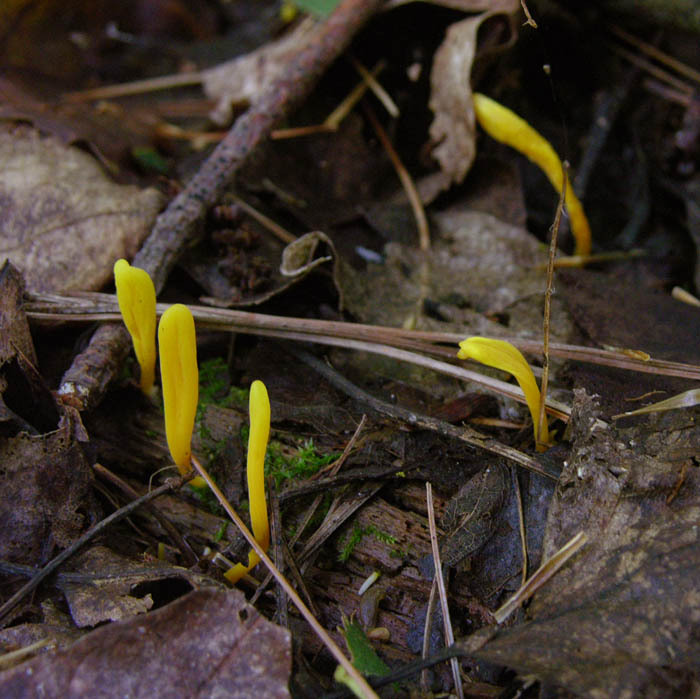 Tiny golden earth tongues brighten the damp leaf litter. 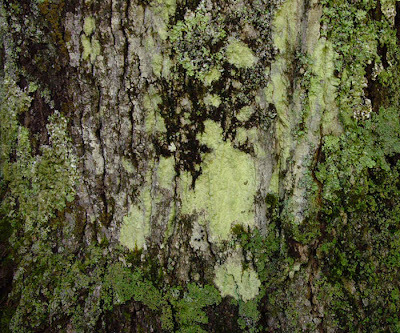 The colors of lichens, enriched by the rains, make a beautiful abstract pattern on a tree trunk, warm and cool greens and blacks (maybe of liverwort) interact with the cool browns of bark: a spreading landscape of imagined hills and fields. After my walk, I felt relieved and happy, seeing the woods with renewed life. But then I drove down into town and what I saw at its western end, near the small river, was shocking. 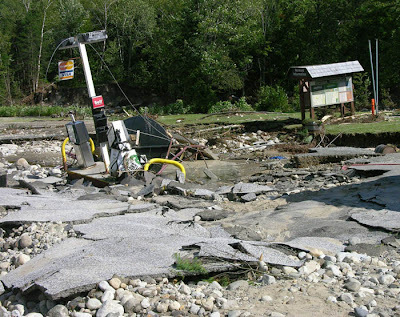 The restaurant/general store had been at the center of a flood which upended the tarmac of its parking lot and filled its cellar. A large tank, empty, for diesel fuel was raised and floated by the river water and gas pumps ruined. A terrible tragedy for this small town business. 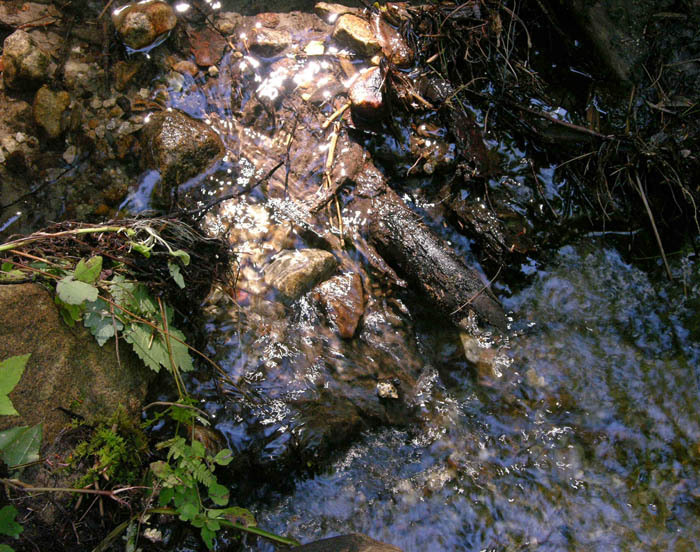 The yard of the town garage was was flooded and the culvert under its entranceway floated above ground. 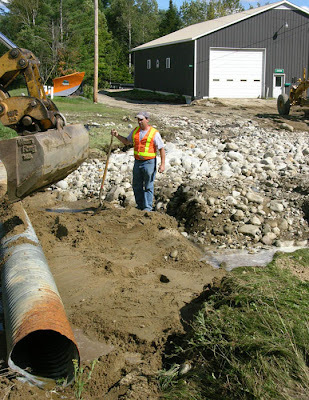 In addition to all the other work our intrepid town road crew – thank you Brent and Phillip! – has to do to repair roads, they also have to repair the garage. Tragic weather events often feel so far away. As soon as my power returned this morning I spent some time looking at the dreadful damage in many small towns in Vermont, but nothing makes it more real than seeing your neighbors affected. This has made me realize that I rarely have enough empathy to truly feel the depth of loss of others; shock, yes, and sympathy, but more? I hope I've been taught a lesson with this flood. And I also have such respect for the emergency personnel, whether police or firefighters or electrical workers or road crews or health workers, who do such a fantastic job. Thank you all. While waiting for Hurricane Irene to arrive with lashing wind and rain, I wanted to think back a few days to the calm rich glow of a late summer evening. At 7 PM the raking light of the sun flows golden over the garden, like a moment of creation. 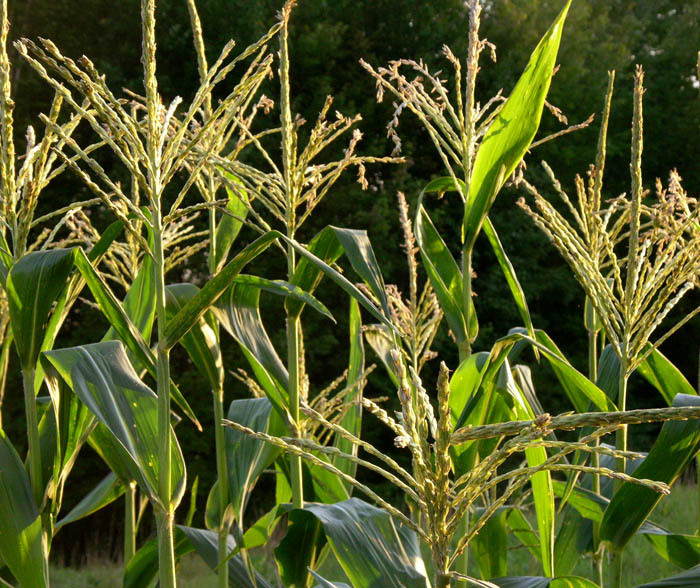 The corn tassels are lit like branching chandeliers, fiery against the dark background of woods. The greens of leaves, warm in light and cool in shadow, point and bend in broad patterns contrasting with the linear texture of tassels. 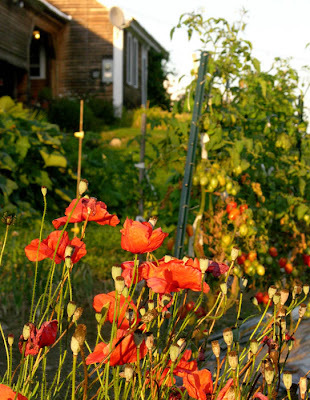 The red of the poppies shifts towards orange in the waning light. 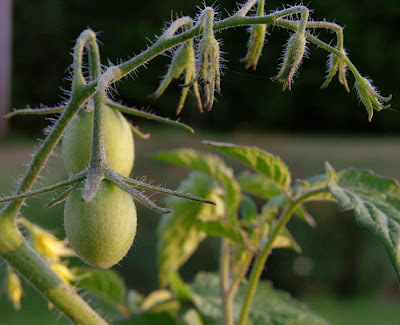 And looking at the young tomatoes, every tiny hair, every surface variation is caught by the low-angled light, allowing us to see the previously unnoticed. Tied, egg tempera on calfskin parchment, 6 x 7 inches. 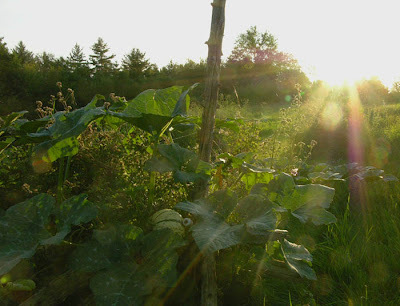 Each spring I go out to farms to gather images for my paintings, and each year my eye – how I see what is in front of me, and what I notice – is a little different. It often surprises me when I realize that an image that so excited me the year before is there in front of me: there's the machine, there are the elements of the painting now finished in my studio, but the thrill is gone. 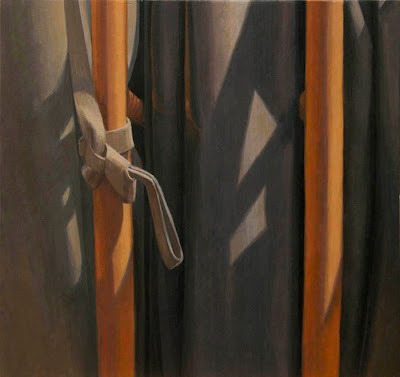 I don't think this is because I've already turned the image into a painting so have moved on; I believe it's that my thinking shifts slightly each year, with new ideas guiding my choice of subjects. Tied pictures a farm implement that I painted before, in a different way. This year I was excited by the two strong simple orange bars, slightly curved, surrounded by black forms. What made the image extra special to me was the flat strap tied around one of the bars. It adds tension, and hints at some emotion or narrative. Orange Crossing, 2010, egg tempera on parchment, 6 1/2 x 4 3/4 inches. Here is the earlier painting I did of this same farm implement. It's a painting I love, but as you can see, it is very different from the one I completed a couple of days ago, with more movement and energy in its curves and diagonals. For better or worse, I am moving towards greater simplicity. When I was growing up in my Syrian Jewish household, one of my favorite Saturday Maza (Middle Eastern meal of little dishes) dishes was Kibbeh Nayeh, a torpedo made up of bulgar wheat and raw chopped beef. In recent years people have grown wary of eating uncooked meat, so my mother gave me this recipe which uses cooked red lentils to bind the mixture. 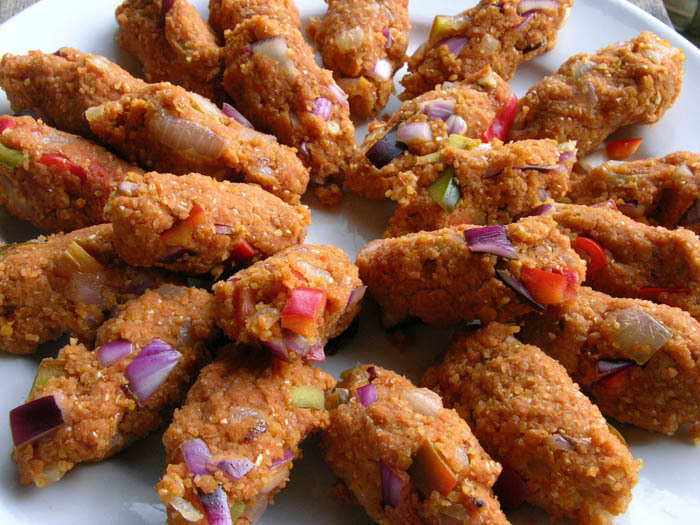 This kibbeh is a spicy, tasty finger food, which has always been a hit when I've taken it to potlucks. It's also easy to make. You have to use finely ground bulgar so it will absorb the other ingredients. I think a more coarsely ground bulgar can be used if it is soaked in cold water until it begins to soften a bit before mixing. Cook the red lentils in the water until they get mushy. Saute 2 of the chopped onions in the oil until golden. Add the lentils and onions with oil to the bulgar. Add the tomato paste, salt, cumin and cayenne. Mix everything together well and let stand for a while until the moisture is absorbed and the bulgar is tender. Add chopped onion (I used red onion for this batch), and finely chopped red or green pepper if desired. With the hands, form into torpedo shapes about 3 inches long. This recipe makes about 45 torpedoes. The photo above shows 1/2 of this recipe, 22 delicious pieces. "Form ever follows function" wrote Louis Sullivan in 1896, and the phrase became a modernist credo. When looking at this display of early irons, with the elegance of their repeating curves, it seems clear to me that good designers of any period paid close attention to function and also took great care in the crafting of a beautiful object. At the Shelburne Museum's Shaker Shed were a large collection of hand tools and household objects: rulers and planes, lamps, saws and stoves, utensils and wooden bowls, plates and dippers. 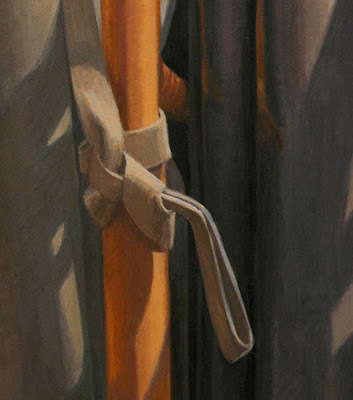 Every piece seemed to have been made with an eye toward its use and also its form, which is why we still find these things so appealing: each is worth spending time with, noticing how one shape contrasts or flows into another, how some are severe, some humorous. 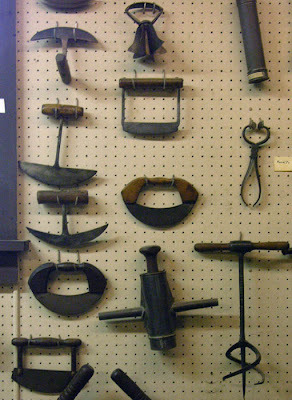 Not all of the tools at the museum had the severe simplicity of the hand tools above. 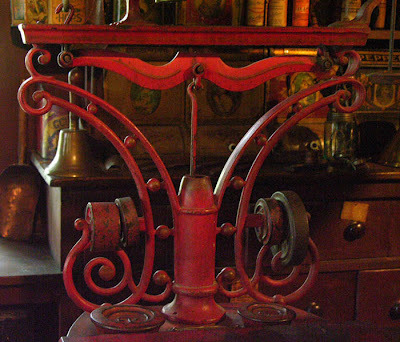 This scale at the General Store is embellished with curves and curlicues – a no-no in modernism – that make this workaday instrument into something more lighthearted. It certainly would be fun to see a design like this at my local supermarket. 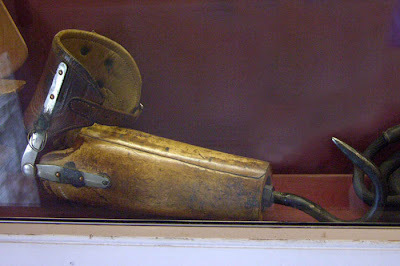 A much more serious tool was in a case along with other medical equipment. While I was photographing this, a young boy came along and with great surprise said "I didn't know they actually had these!" For those of us brought up on Captain Hook, false limbs like this hook or a pegleg, seems only the stuff of fantasy. In the Print Shop were many old presses, like this Cottrell Flatbed Cylinder Press from 1871. 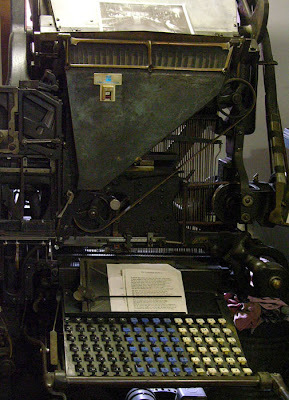 It was in use until 1971 at a small newspaper in Hardwick, Vermont. 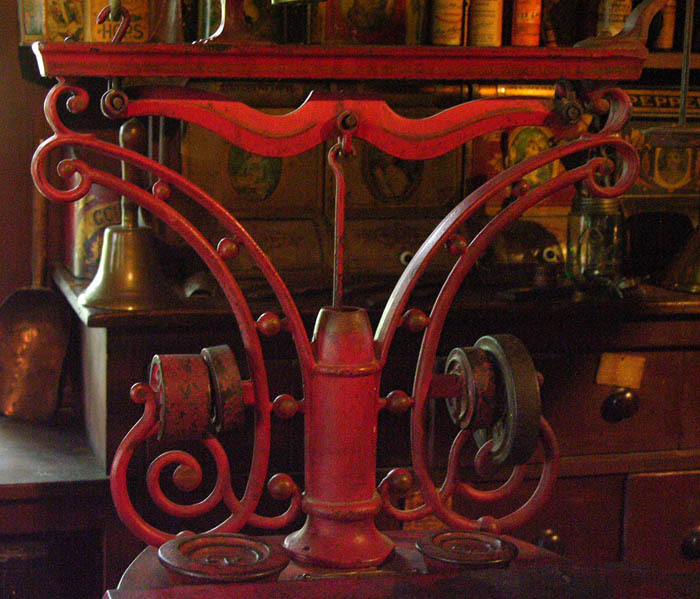 I love the repeating circular brass forms, which I'm sure also had their function. Less beautiful, but so interesting, is this linotype machine, a Mergenthaler Linotype, Model 8, made in 1914. 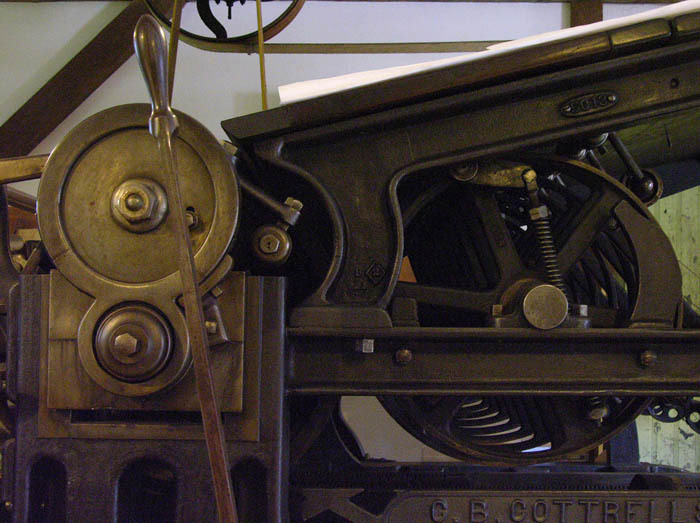 This modest machine revolutionized the printing industry, eliminating the need for typesetting. The last two images come from the engine deck of the Ticonderoga, a paddlewheel steamship built in 1906 and moved to the museum in 1955 from Lake Champlain. It was dark and mysterious down there, not least of all because I didn't understand what the dials and pumps and holes and rivets and beams were for. But they were marvelous, the curves of the gauges above like surprised faces, like Munch's The Scream actually. This was a gorgeous space which reminded me of looking into a Anish Kapoor or Richard Serra sculpture. The combination of straight and angled walls, topped with a curve, the projecting rivets and sunken holes, the dramatic light, make a atrong statement that transforms a working structure into something close to art. We've had a succession of glorious late summer days – clear skies, mild air, gentle breezes – days making it almost impossible to stay indoors and work. As I sit at the picnic table, shaded by the backyard tree, the fact of late summer sliding into fall is unmistakable. The robins have left, the crickets and cicadas are loudly singing their ode to shorter days, the apple trees in the orchard are hung with bright red balls of ripening fruit. 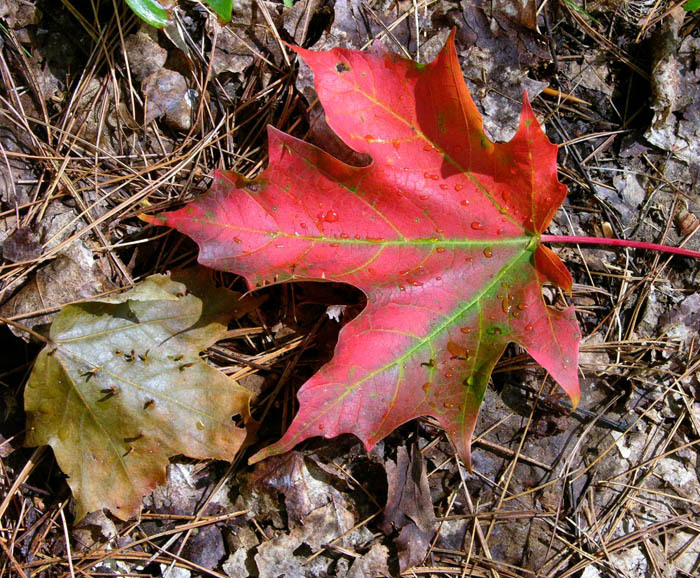 In the woods, a single red leaf on the path reminds me of the brilliant color soon to come. 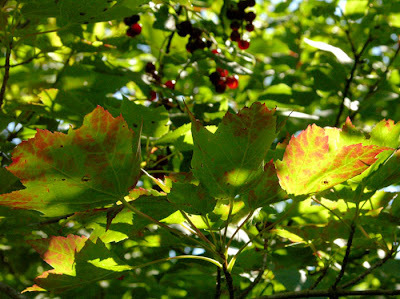 Along the stone wall in my orchard is a maple that is the first to show color each year. Its leaves are now tipped with red, giving the tree a look of warmth among brighter greens. 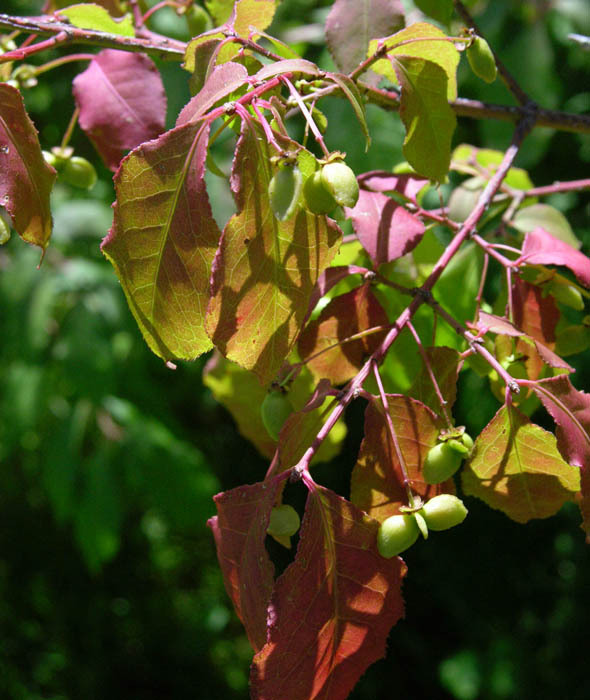 The deep red of the chokecherry berries add a festive touch. The Burning Bush next to the barn is the first shrub to color; in early fall it will be a flaming red. 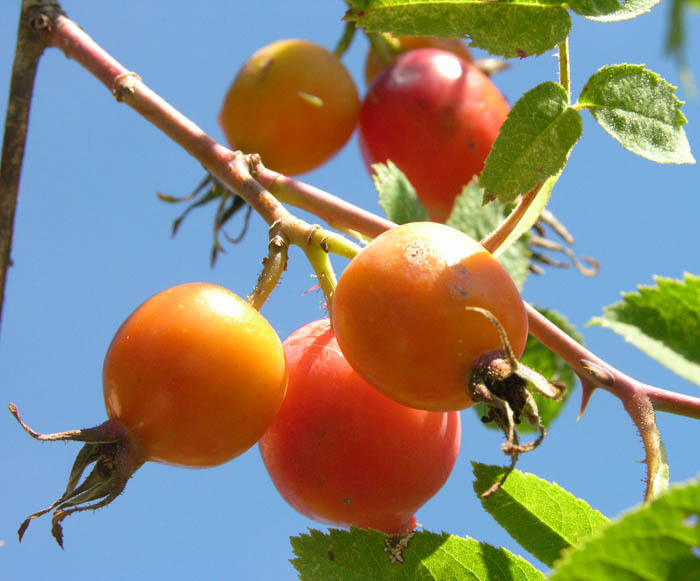 The rose hips announce the end of summer as they ripen into deep orange or crimson. 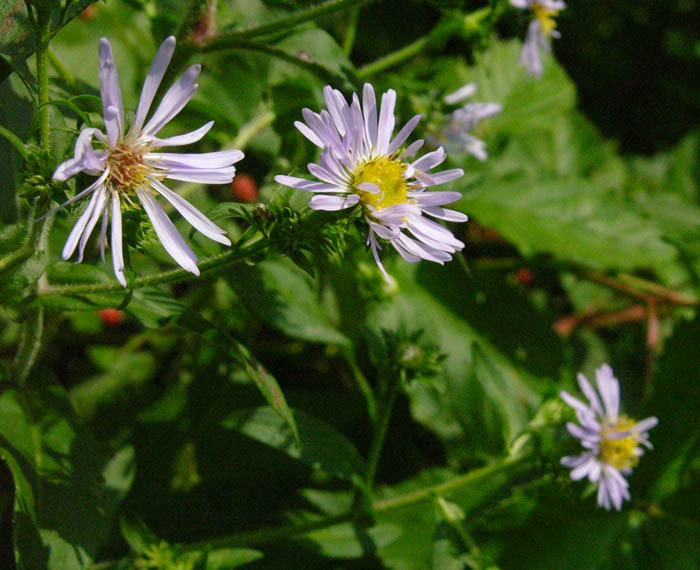 The wildflower that announces summer's end for me is the aster, just come into bloom. 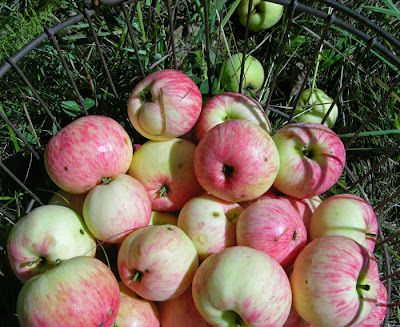 The first apples of the season, Sops of Wine, are ripe. What could be more of a fall activity than picking apples and then making a big batch of apple sauce? I canned five quarts of sauce yesterday, with more to come as the main crop comes in. And yet, even with all these signs of coming fall, summer is still fully with us. 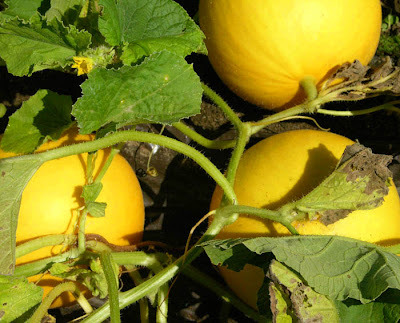 The melons are ripening in the garden, as are the tomatoes. I baked some challah bread today so I can have my much anticipated lunches of lettuce and tomato sandwiches. 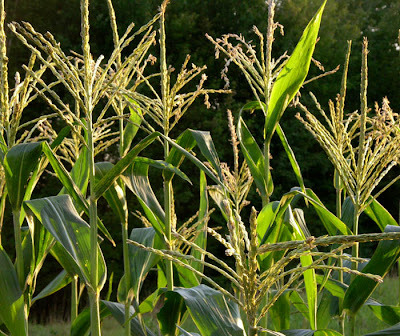 The corn, a staple of summer, is delicious; I eat two ears each day. There are eggplants and peppers and blueberries. What a confusion of delights, as summer mixes with fall. Mushrooms are among the most mysterious life forms. The ancient Greeks believed they came from Zeus's lightning because they appeared after rains and reproduced and grew inexplicably. 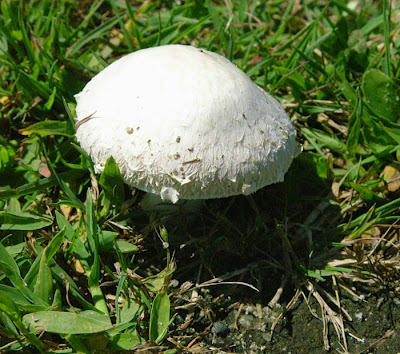 In the Middle Ages, the circular patterns formed by some mushrooms were dubbed "fairy rings" and wer thought to be the work of the "little people"....In the New World, some hallucinogenic mushrooms have been called "the food of the gods" and invested with supernatural powers. The mushrooms we see above ground are the fruiting bodies, producing reproductive spores, of a fungus that lives out of sight. 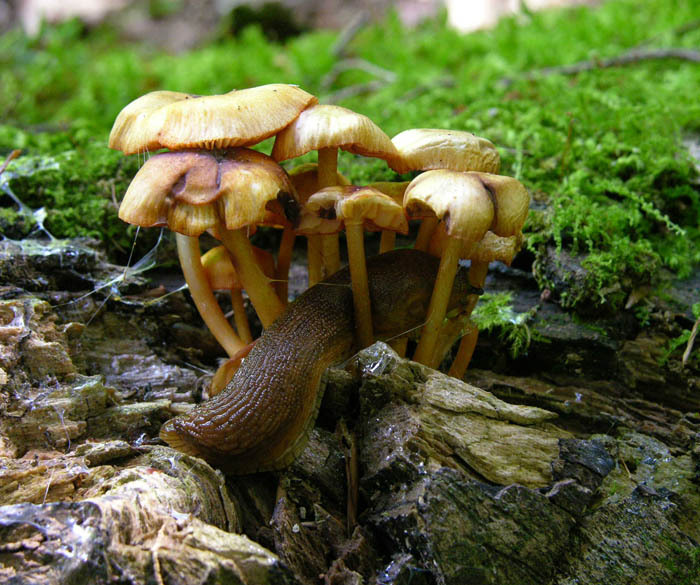 One thing that fascinates us about mushrooms is that some are deliciously edible, these little brown ones by slugs, not humans. 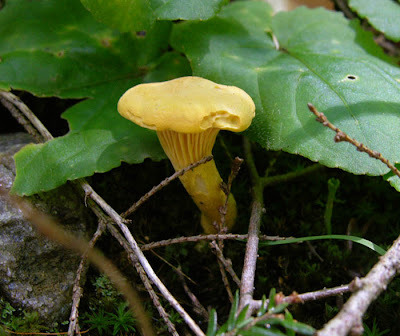 This chantarelle, though, is a delicacy that many of us love to collect in the woods. They are delicious sauteed lightly in butter for an omelette or a pizza. But then there is the dread that mushrooms also evoke since some of them are deadly and can be confused with more benign toadstools. This amanita is poisonous. I would only collect mushrooms to eat that I'm very sure of - chantarelles and puffballs – unless I'm with a mushroom expert. 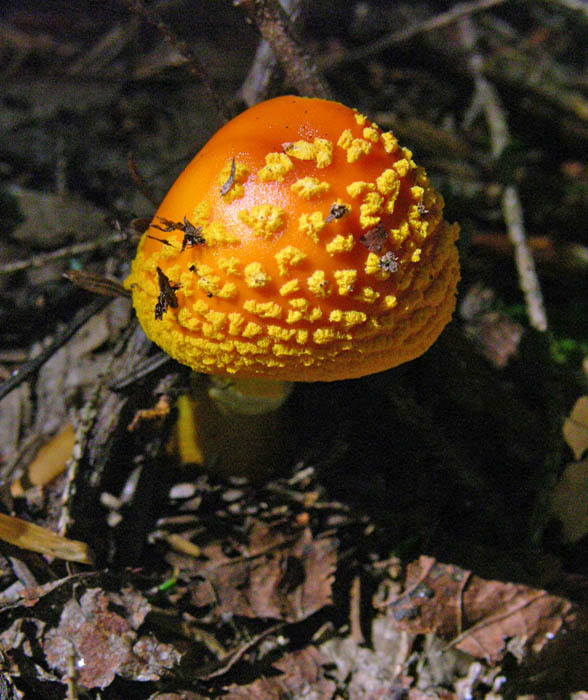 Another wonderful thing about mushrooms is their huge variety of color and shape. I noticed this tiny 1 inch stalk topped by what looked like a little waving glove. When I looked it up, I found one called "Velvety Fairy Fan" which seemed very similar. What a wonderful name...a fairy fan! 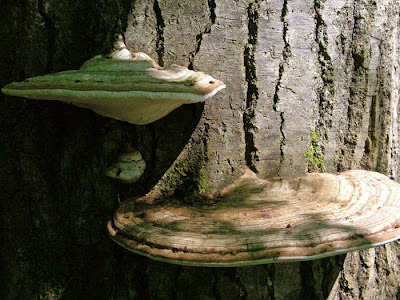 There are many kinds of shelf mushrooms, which generally grow on dead or dying wood, forming semi-circles of white or brown, or multi-striped. 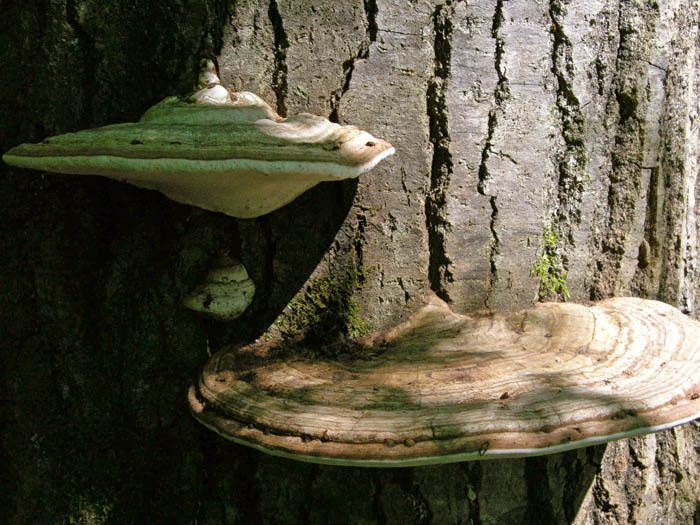 One type has a smooth white bottom that can be etched into when fresh or painted when dry, and is called an Artist's Conk. These small mushrooms are Carbon Balls, well named since they look burnt. 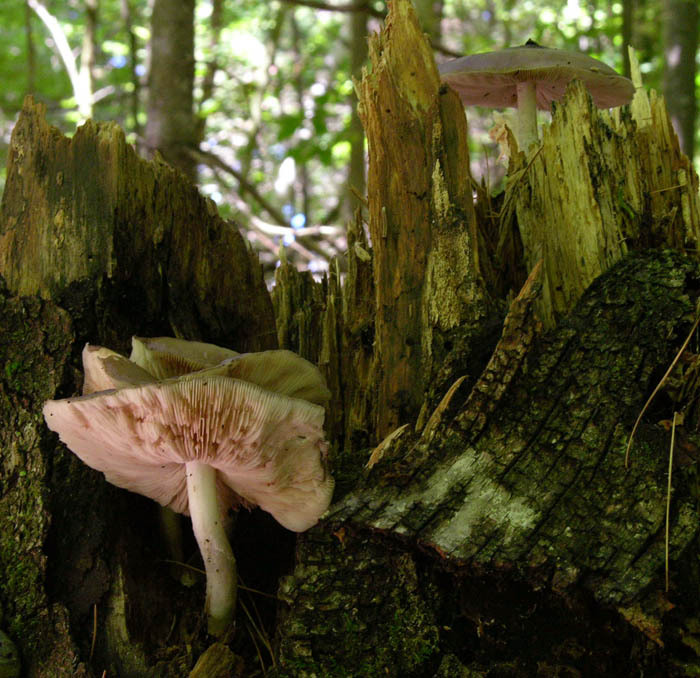 It's hard to believe that these are mushrooms as well as the more familiar and charming toadstools. One of my favorites of the oddly shaped mushrooms are the jellies, that look as though they are oozing from the wood in gorgeous color. 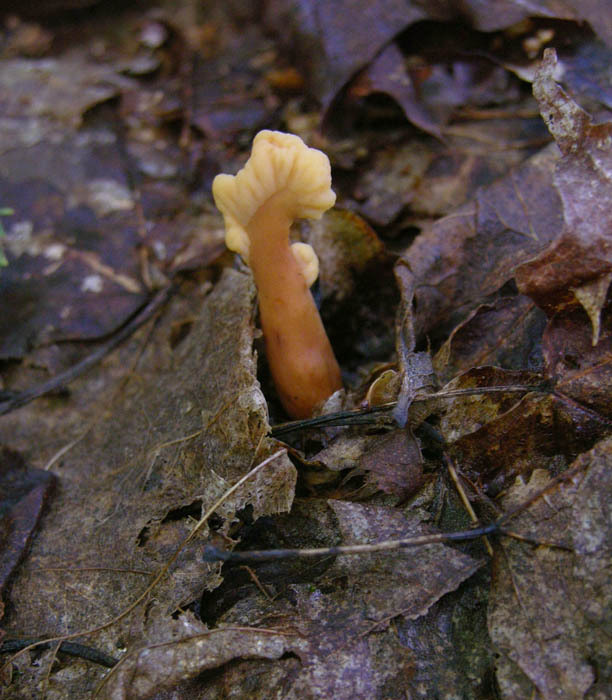 This jelly is one of the stranger forms, but there are also cup shaped mushrooms, scaly mushrooms, coral-shaped mushrooms, funnel shaped mushrooms and round puffballs. And the strangest of all are the slime molds, which Lincoff calls "the Dr. Jekylls and Mr. Hydes of the plant world". They appear and disappear so quickly that they are hard to identify and can change shape and color as they do so. 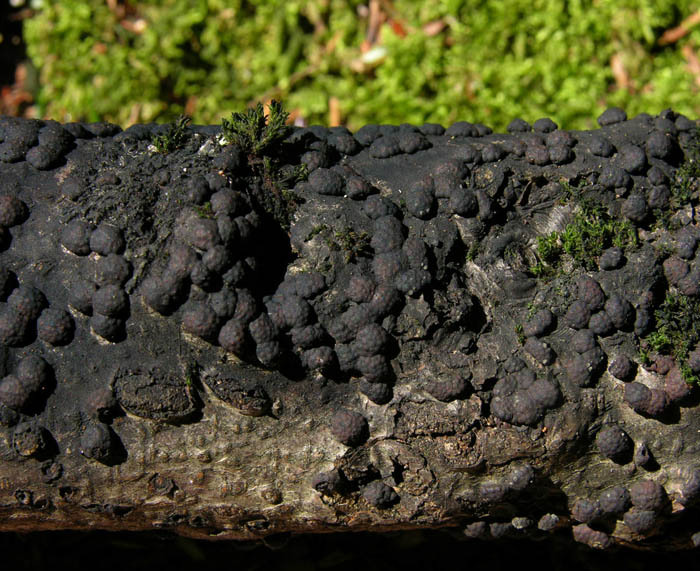 They can actually move, using a gelatinous substance called "plasmodium". 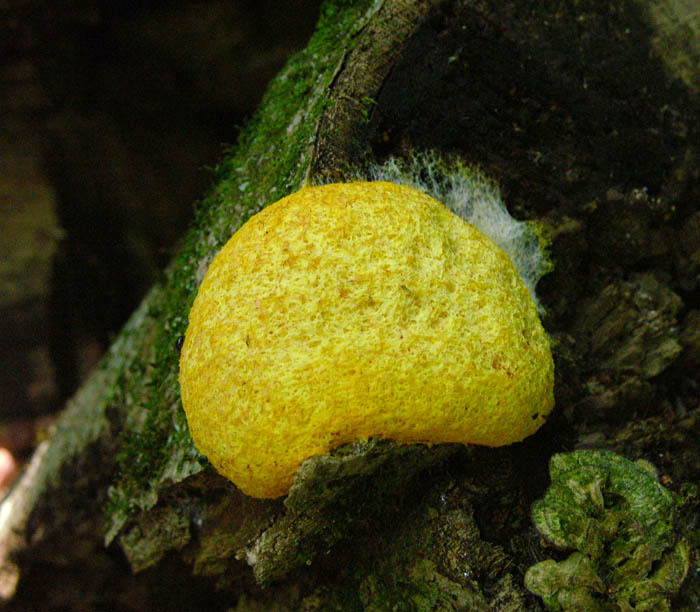 How's that for a science fiction plot, with this small blob imagined much, much larger; can a slime mold have been the inspiration for The Blob? 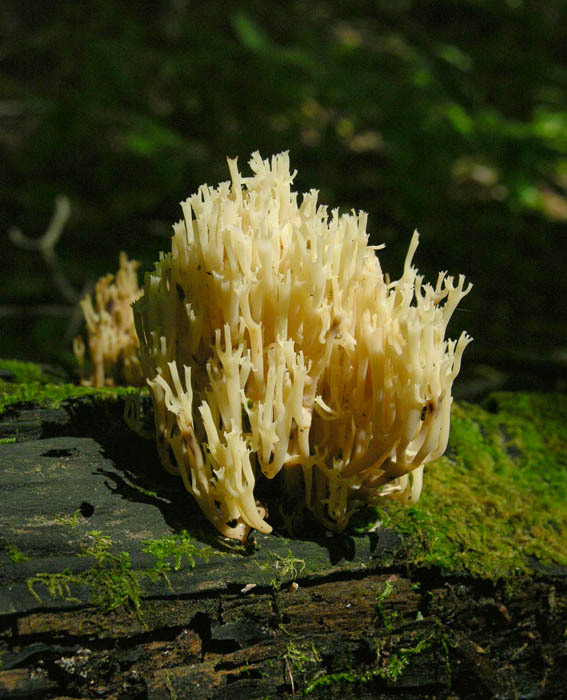 This, and all other mushrooms, are to me surprisingly and mysteriously beautiful. 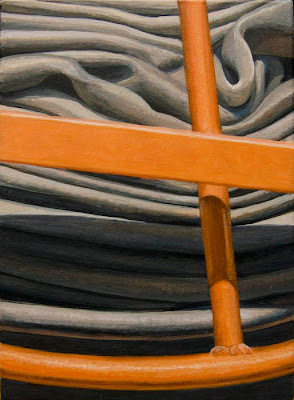 "The Sound of a Wild Snail Eating"
A New Textile: "Light Red/Green Ground"
A New Painting: "Three Pipes"